The Mirai's low center of gravity gives it dynamic handling while its fuel-cell provides ample energy to power the car, Akio Toyoda said. NEWPORT BEACH, California/TOKYO (Reuters) - Toyota will introduce its first mass-market fuel cell car next month, hoping to replicate the success of its Prius hybrid with a vehicle that runs on hydrogen instead of gasoline. The four-seater sedan, named Mirai, the Japanese word for "future," will first go on sale in four cities in Japan on Dec. 15. Sales in the United States and Europe will follow in the fourth quarter of 2015, Toyota said, unveiling the car simultaneously in California and Tokyo. Fuel cell vehicles (FCVs) run on electricity made by mixing hydrogen fuel and oxygen in the air - a technology first used in the Apollo moon project in the 1960s. Its only by-product is heat and water - water so pure the Apollo astronauts drank it. "This technology is going to change our world," Toyota Managing Officer Satoshi Ogiso said at the launch in Newport Beach. The Mirai will cost 6.7 million yen ($57,460) before taxes in Japan, which on Tuesday announced a subsidy of 2.02 million yen on FCV purchases. In the United States, it will cost $57,500, which could drop to $45,000 after federal and state incentives. Toyota aims to sell just 700 globally next year, mainly due to a dearth of hydrogen fuel stations, executives said. It expects cumulative U.S. sales to reach 3,000 by the end of 2017. 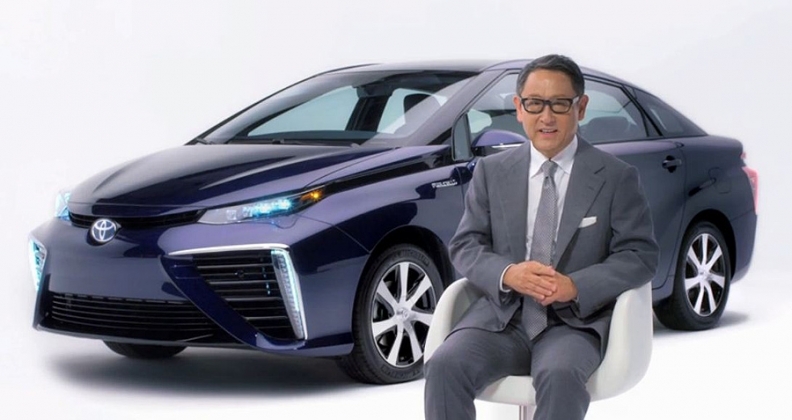 The Mirai’s low center of gravity gives it dynamic handling while its fuel-cell provides ample energy to power the car, the video transcript quoted Toyoda as saying. The announcement increases Toyota's commitment to fuel cells, as opposed to battery-only cars, as long-term alternatives to internal combustion engines, said Jeff Liker, a University of Michigan engineering professor. He predicted that Toyota's fuel-cell commitment will be as significant when it started selling Prius gasoline-electric hybrids in 1997. "In most cases, Toyota has been a fast-follower, not a leader," Liker said. "But when it comes to the environment, they're seeking to play an aggressive leadership role." Many battery-only cars in the U.S. can travel fewer than 170km (100 miles) on a full charge, and charging them can take hours. Toyota argues that fuel-cell cars can provide the same clean transportation with far greater convenience. And with a low center of gravity, "it's particularly fun to drive, Toyoda said." Automakers are under pressure in California, as well as across the U.S., Europe, Japan and South Korea, to offer vehicles that emit little or no carbon pollution and reduce petroleum use. Battery-powered cars championed by Tesla Motors and Nissan Motor Co. store electricity in large lithium-ion packs. Fuel cells generate it in an electro-chemical reaction of hydrogen and air, producing only water vapor as a byproduct. To help promote fuel-cell sales, California plans to install more than 50 hydrogen fuel stations within two years, partly with financial support from Toyota and other automakers. Toyota will also start working with Paris-based Air Liquide to build 12 fueling stations in five northeastern U.S. states, the company said in its statement. Most commercial hydrogen is made from natural gas in a process that consumes energy and emits carbon. Hydrogen, the most abundant element in the universe, is also the lightest, making it difficult and sometimes dangerous to store and transport. Honda on Sunday also unveiled a pre-production version of its first mass-market FCV in Tokyo but stopped short of giving a price or sales target. Honda, which with Toyota launched the world's first road-ready FCVs in December 2002, pushed back its estimated sales start in Japan to the year ending in March 2016 from the original 2015, citing overall delays in vehicle development due to quality problems. It now expects U.S. sales to start no earlier than March 2016. Honda's yet-to-be named fuel-cell sedan seats five and has a range of over 700km (435 miles).